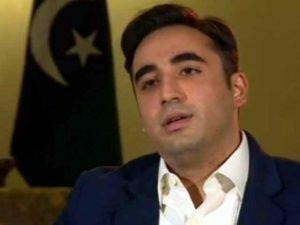 ISLAMABAD: A Joint Investigation Team (JIT) constituted to probe into alleged money laundering committed by senior Pakistan Peoples Party leaders through fake bank accounts has included the party’s chairman, Bilawal Bhutto-Zardari, in its investigation. According to Mr Bhutto-Zardari’s spokesman Mustafa Nawaz Khokhar, the JIT has sent the PPP chairman a questionnaire containing queries about his bank accounts. “Mr Bhutto-Zardari has received a questionnaire and he has to respond by Nov 29,” Mr Khokhar told . He, however, rejected media reports that the PPP chairman had been summoned by the JIT and said he had only been asked to respond to the queries in the questionnaire. Mr Khokhar said that former president Asif Ali Zardari and his sister Faryal Talpur would appear before the JIT on Wednesday (today) in Karachi. The JIT was formed on the orders of the Supreme Court last month to probe alleged laundering of billions of rupees through fake bank accounts in connivance with bankers and others to allegedly benefit several people, including Mr Zardari and Ms Talpur. The Federal Investigation Agency (FIA) had been investigating a 2015 case regarding fake accounts and fictitious transactions conducted through 29 ‘benami’ accounts in the Summit Bank, Sindh Bank and United Bank Limited. Seven individuals, including Mr Zardari, were said to be involved in using the fake accounts for suspicious transactions that were said to amount to Rs35 billion. The accounts were allegedly used to channel funds received through kickbacks. Chief Justice of Pakistan Mian Saqib Nisar while ordering the formation of the JIT had said the investigations could be carried out in Sindh, but the FIA director general was of the opinion that it should take place in Islamabad due to the nature of the case.